CorningWare 411: Greetings and Salutations! It had to happen eventually. With all the accolades I have bestowed upon CorningWare's original Pyro-Ceram formulation, as opposed to the cheap stoneware they pass off now, I figured that it was time to move all of the Pyro-ceram praises to one place. This will allow me the opportunity to "gush" freely about one of my favorite cooking utensils as well as provide any potentially useful information I may have acquired during my Goodwill and Salvation army combings over the years. Granted, I don't know dates of pattern releases or production run counts prior to discontinuation, but I can tell you that I still know more than the current customer service reps at World Kitchen. What exactly IS real CorningWare? Mr. S. Donald Stookey of R & D was testing a type of glass plate used in early TV production..... The furnace malfunctioned and the temperature rose from 600C (1112 F) to 900C (1652F). Surprisingly, the glass plate didn't melt into a glowing viscous pool, though it DID turn a funky shade of white. Which doesn't make for satisfactory television viewing. Convinced that the test was a failure, Mr. Stookey attempted to removed the tile of milky white glass from the furnace, but had a butter finger moment and dropped the tile on the floor. To his utter surprise, it did not shatter into a million pieces. On further inspection of this strange material it was discovered that the abnormal conditions within the furnace had crystallized the glass. What does this mean? Normally glass is an amorphous "mix", meaning there is no organization to the molecules, thus light passes through. Once crystallization occurs, the order to the molecules begins to make the glass cloudy. Thus the white color. Another characteristic of normal glass is thermal expansion, meaning it expands when it is warmed and contracts when it is cold. Some forms of glass, such as Boro-Silicate (Pyrex) have much less expansion, meaning that the glass will not shatter or break during temperature changes such as oven baking. One of the advantages to this partial crystallization of glass is that thermal expansion is reduced to almost zero. This is why Pyro-Ceramic glass (Old CorningWare) can be taken directly from the refrigerator and placed on the stove, or moved from the freezer to a hot oven without shattering. Don't try that with the modern stoneware. This material was so completely awesome that Corning began manufacturing missile nose cones out of it. Suddenly, in 1958 it was realized that this new "space age" material would be a great cooking receptacle. Fun fact... Their choice of design was a mistake too. There were several test marketing runs with several designs before full production. A golden/brown wheat pattern was suppose to be the original design. Accidents happen though, and in the plant's the haste to get the product to market someone messed up and the now "oh so familiar" CornFlower was placed on the entire production run. In the end, it was so popular that the misapplied cornflower eventually became the symbol of CorningWare itself. Through the next 3 decades 1958-1987 there were many patterns and changes to lids as well as structure- the original run had "fin" handles instead of the round knobs on top. Here is a quick timeline of CorningWare and a snippet of what caused the angst I harbor against World Kitchen's current Pseudo-CorningWare offerings. 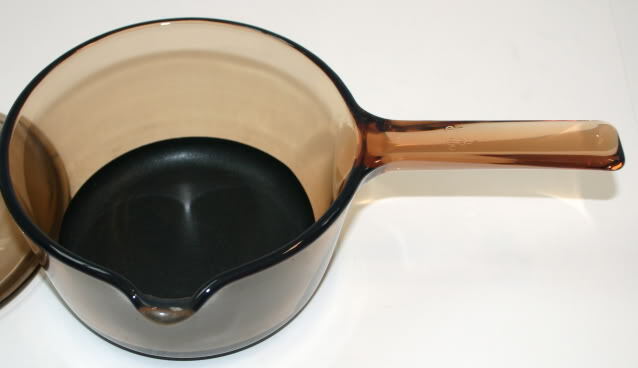 1966 - An "Amber-transparent" Pyro-Ceram is developed, but not released in the US for fear of reducing sales of both Pyrex Ovenware and Pyro-Ceram white CorningWare. This product would eventually become "Visions", manufactured in Avon, France in the late 70s. 1972 - The dishes became slightly more straight sided and had larger side handles. But I will get into specific printed patterns at a later date, for there are many. And each one of us kids have amassed different patterns in our collections. 1975 - Merry Mushroom pattern released to coordinate with the "Merry Mushroom" collection sold only at Sears & Roebuck. The dishes were round like the buffet servers, but had lids from Pyrex's "Sculptured Ovenware" line. 1978 - My favorite pattern was introduced.... French White. I know, this is the pattern that World Kitchen is still producing in Stoneware, but it's a sloppy reproduction in an inferior material. The edges are not as crisp and clean as the original Pyro-Ceram version and they are not as gleamingly white, having a slightly "off" tinge to them. But I digress. 1981 - "Visions" Amber by Corning (Avon, France) is introduced to the American Market due to slumping sales of White Corningware. It becomes so popular that the Martinsburg, WV plant begins production of Visions as well. 1989 - Non-stick surfaces added to Amber Visions in order to boost sales. But it wasn't just 1 other color... For low and behold, there were 2 "designs" released as well which were beige. Symphony, pictured below, was one of them. Yes, now CorningWare came in not only in solid White with applied designs but in solid Black and solid Beige with applied designs! Not painted like French Bisque had been, but Beige or Black all the way through the piece. 1992 - Cranberry Colored "Visions" is released. 1995 - Shane, that would be me, buys his first 2 pieces of Corningware (Though I had grown up with my mom using the CornFlower from her wedding in 1966) For me, it was a French White "set". The 1.5 liter Souffle dish (without a lid) and a 10 inch quiche/tart dish. Love at first bake. 1998 - The consumer division is up for sale and subsequently purchased by Borden, Inc.... The beginning of the end for Pyroceram cookware in the United States. 2009 - To my surprise, World Kitchen re-released the CornFlower version of Pyroceram Corningware under the name of "Stove Top" which is funny, cause the original stuff (before they tampered with it) was always able to be used on the stove, in the microwave, in the oven and under the broiler as well as storage in the refrigerator and freezer. Evidently enough people have been screaming for it. I have no idea if this is a limited release or not, but it is available on their web site in both Retro Cornflower, European Herbs, White Swirl (which is limited edition), Sakura (cherry blossom), Simple Lines (black line swoops), Shadow Iris and and Just White. AWESOME!!!!! Though alas, still no return of the original French White. But I have much less angst towards them for calling me a liar. September 2011 - I decided to start this Blog in an effort to get any information I may have that might be helpful to fellow Corningware-ophiles out onto the Internet. Roasting pans and Serving platters with the occasional Pie plate, Bread pan or even Cake pan thrown in for good measure. Snack-it plates and the Side Kicks and the Grab-it casserette dishes and the tea kettles and the drip coffee maker and blah blah blah.... Suddenly I have a TON of the stuff... More pieces than I can possible use... So now I call it a collection. My other brother collects Callaway Ivy... Which is a great pattern, since it spans both traditional square pieces as well as begin applied to the French White. Though my grandmother originally had mostly Cornflower, she is now into the Grab-its, Snack-its and Side-kicks. 3 generations of Corningware users... Sounds crazy, but we all love it and are ecstatic that World Kitchen has brought it back, even if only for a limited time. Look forward to interesting pieces as well as some great recipes utilizing Corningware for it's intended purpose... On the Stove top as well as in the oven. I am also interested in any Corningware stories any readers may have. I personally have dropped many pieces onto my Kitchen floor, which is tiled... Not a single piece has broken (Except for the stoneware one I bought on accident)...Would have served better as a boat anchor anyway. Love your new blog...very informative. I remember my aunt had a coffee pot in the Corn Flower blue. This was back in the late 60's, she kept it on her stove and it was in constant use. I moved out on my own in the mid 80's and my pattern was Spice of Life, I still have it along with some French White and a few Grab-Its. Great blog Shane, I learned a lot. Shadow Iris is one of my favorites too, it's my everyday dinnerware. I still use my grandmothers Cinderella bowls (gooseberry) that my mom also used before I claimed them, and that's well over 50 years of use. I look forward to future installments of CorningWare 411. Glad I came to your new blog, very interesting reading. I love my CorningWare also. I have the French White 4 piece casserole set, I used to have 4 grab it bowls, which I now only have 2 (people who must have loved them too much to return them caused me to lose 2) I have a set whatever the pattern is with the almost orange hearts etc. around the outside. I now have a pattern with cherries etc. on them to match my kitchen colors. My sister has the Corn Flower blue which she has been using since she got married. I have been to Corning New York to look for bargains on Corning Ware, don't waste your time. No bargains there. Sheryle - Thanks.. My mom always had her cornflower tea pot on the stove... When she switched to Shadow Iris, she gave me her old teapot. It's the one I use to heat water for my french press... Seems to heat up really fast. Carol - It's funny you mentioned the Gooseberry Cinderella bowls... My mom has the pink and white set, I have also seen a yellow and black set on ebay. Patti - I have to watch my grab-it's like a hawk, or they disappear. I didn't know there was a cherry pattern. Very interesting. I have a Merry Mushroom casserole like the one you show, plus a shallow round quiche kind of dish. Can these really be used on the stove top and they won't explode? I have a ceramic top, and don't want to break either the stove top or the casserole! Bobbi - Not really sure about the quiche dish, simply because it would be a little shallow to use on the stove, but yes, your Merry Mushroom can be used on the stove top, as long as the bottom is smooth (instead of having the Stoneware ring where it sat in the kiln) When cooking on the stove though, I suggest not using high heat. Stick with Medium or just barely above Medium. I have burned on pineapple juice on the rim and handles of my casserole dish which I cannot seem to remove. Any suggestions would be appreciated! Have you tried baking soda paste? I find it works fantastic to get stains and burned food off of Corningware. I use Barkeeper's Friend with a nylon scrubber from the dollar store for hard-to-remove foods and stainless scratches from utensils. I mix it with a little warm water directly on the Corning Ware, let it sit for a minute, then put a little elbow grease into it. It usually works. I have also had good luck with plain old Comet cleanser on my Corningware and other cookware when the baking soda or liquid cleanser isn't enough. Yellow can of Easy Off Oven Cleaner. Spray it, leave it for about 20 mins, rinse and soap wash off. Works like a charm. (Don't breathe while spraying it, trust me.) No elbow grease and you will love the results. I use Bar Keepers Friend, it is available in most supermarkets and is very inexpensive. It works miracles on many different surfaces. Good luck, and let us know how you made out. Thanks to Patti and Shane for their suggestions. I ended up soaking the bowl with water and 2 denture cleaner tablets. That got most of it and I finished up with Barkeepers Friend. Whew! I love these bowls! Glad we were able to help you. I have used the baking soda on many types of glassware and it also is inexpensive and works well. I found numerous Corning pieces at a 5-mile yard sale near my home this past weekend -- this Corning collecting is becoming, well, suffice it to say that I may need a 12-step program in the future! I'm trying to get some pieces for my 20-something-year-old kids to use.... I will have to demonstrate it to them, as I think they have no idea that the stuff can be used stovetop etc! Thanks Shane, for your great blogs and info about Corning. One more question.... I have found many pieces that have no lids; the replacement lids available on World Kitchens must be the cheapie soda-lime glass, yes? 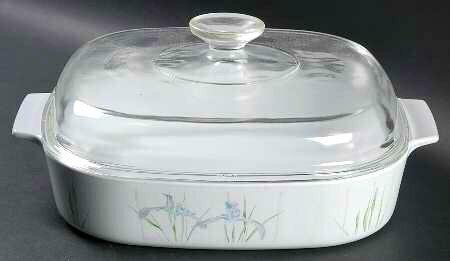 Is it possible to get borosilicate glass replacement lids for Corning casseroles anywhere? As far as Borosilicate glass lids, your best bet is to check Thrift Stores, Goodwills and Salvation Armys. Some of the lids will fit multiple pieces simply because the dishes are the same diameter, but are either deep or shallow. 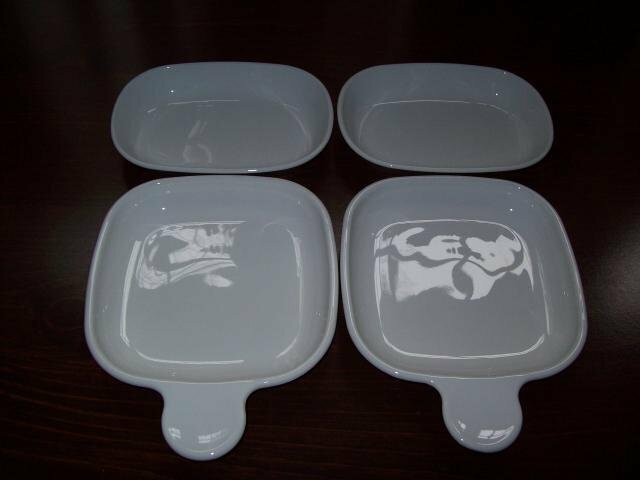 I have 1 lid from the French White series (pre-1990) that fits 3 different pieces because the dish size came in a 2 inch shallow, a 3 inch medium depth as well as a 4 inch deep version. 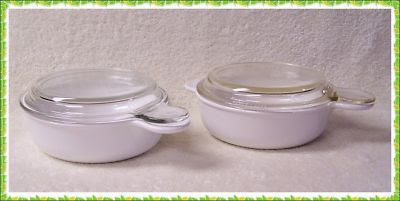 How can one tell the difference between a borosilicate Pyrex lid and the other? Thanks! Hmmm. I have a large lid here with a large knob that fits the 5-liter casserole dish and on one side of the rim it has engraved on it: 10-H and on the other side it says: A Pyrex (c) A-12-0. I wonder if that is a clue. ( am not really certain what you mean by fluting, but there definitely is a larger "cut" circle around the knob -- and I'm guessing that means this is a soda lime lid?) Thanks again for your help! I have lost so much money getting rid of Visions and Pyrex cookware that I don't trust anymore due to reading way too many stories of surprising breakage at very odd times. I will live with a new soda lime lid if I must, but it would be nice to know if it was borosilicate! I am a new comer of french white.going to buy a piece can u advice me? Make sure to check the bottom, it should be smooth. If there is a firing ring, from being in a kiln, then it's stoneware and not pyroceram. World Kitchen has re-released the original pyroceram formula, under their "Stovetop" line, however French White is no included in this line, thus all new pieces available in the stores are made of stoneware. Your best bets are second hand & thrift stores such as St. Vincent dePaul, Good Will, and the Salavation Army stores. I have seen the original French White in antique stores, but honestly, since it wasn't released until 1978 I have a really hard time thinking of it as an "antique"... Retro maybe, but not an antique. It's not nearly old enough yet. Hi can u pls guide me . 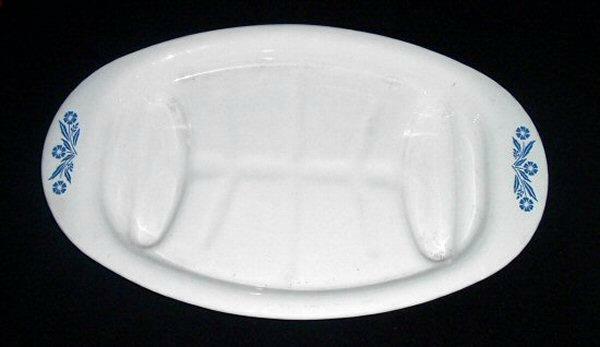 I am a new user of french white n it make me real confuse in finding atrue pyroceram french white.i just bought 2.5 q casserole plus individual 2pcs.i see some in internet on the bottom of the piece is stamped made in usa but mine one just describe on the code only.my friend said if stone ware the company now stamped with made in china.so mine one is? Firing ring?how it look like? @Diana - Thank you for stopping by. I am preparing a new post regarding the physical differences between the original pyroceram French White and the New stoneware French White. It should be ready in the next couple of days. Hopefully that will explain all. Especially about the firing ring on the bottom. Thank u thank u very muchhhh.. real appreciate it!!! I have square casseroles in various sizes in the Abundance pattern. Are they safe on the stovetop? They are smooth on the bottom and there is no unglazed rim underneath like on the French White stoneware I own. 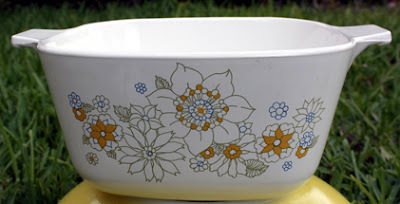 I'm still thinking of replacing them, though, since I just updated my dishes to the square Daisy Days pattern. i think the Simple Lines would coordinate better. Yes, your abundance pattern is stove top safe. If you are keen on having a new pattern there are some of the original pieces that were produced in white, with no pattern at all. There is also a pattern that has been released in the "New" stove top line (World Kitchen re-released the original pyroceramic formula in 2009) that is called "Just White" I think they are even having a sale right now on their web site. If you buy 2 pieces, you get one free! Shane--great blog! My hubby and I just made a pot roast yesterday and didn't have a big enough pot to roast in, so we wwent to the basement where we had a Corningware 4 qt. vessel. It had been in my fathers kitchen when I was growing up. Then the big question arose--Can we use it on the cooktop (gas) to brown the meat?? That was yesterday so we browned the meat in a stainless pot, and then transferred everything to the Corningware and put it in the oven. Great pot roast. Our pot says Corning Ware (with small flower stamp)B-4-B 4 qt., Made in U.S.A. The bottom is smooth white, and the sides are kind of a yellow/beige with a white interior. I'm still a little nervous to try it on the gas burner but it would be fabulous if I could--do you know about this aspect? Hi Jann, Welcome to Corningware411! It sounds to me like you have what is known as a "4 QT Buffet Server" in gold (They also came in pure white and Green on the outside/white on the inside.) My guess is that the lid is golden as well and has a black handle. Yes, you can use it on your gas range, the only issue with the colored buffet pieces, is that the yellow color is only paint applied to the outside of the piece. It may wear off over time if the piece is washed in a dishwasher, due to the acidity of dishwashing soaps. Other than that, your buffet server is good to go on the stove top. :) Happy Pot Roasting! Does anyone know of a key (explanation) for the different symbols that have been used on corningware to indicate stovetop with or without metal 'star' diffuser? I have a P-106 teapot, but it has a different symbol than a smaller and larger one that I do use directly on an electric range element. Or, just let me know if the P-106 is fine for direct element heat. Many thanks. Thanks for the great blog. I'm in the process of replacing all my metal cookware with the new pyroceram and the amber glass Visions for health reasons. Hope this stuff works well and that I won't have problems with food sticking and burning. Still waiting for my large order to come in so haven't been able to test it out yet. I have 2 casseroles that I've had for a while and I'm not sure if they are the original pyroceram material that I can use on the stovetop. They are made in the USA and are smooth on the bottom. How does one tell the difference between the original and the stoneware? Also, I'm wondering if it possible to remove grey scratch marks from using metal utensils? Are these actual scratches to the material? Anonymous from March 23rd - As far as I know, P-106 is a 6 cup tea kettle that could also be used as a manual drip coffee maker. Though it's shape is different from the original P-104's and P103's (having the longer "neck") it is suppose to be safe to use on the stovetop. 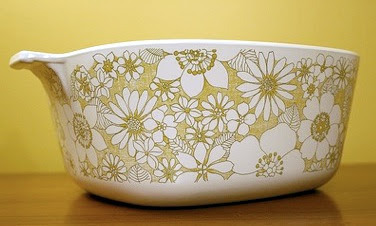 What do you think of the Range Toppers version of Corning Ware? It's the items with a bonded aluminum base. Do those distribute heat more evenly? It seems there aren't many of this type in circulation. Why is that? I bought a couple of Range Toppers (both frying pans) because I had terrible heat distribution on my (previous) Visions frying pan and thought they might help. They are better than the glass Visions pans, but heat distribution is not really great -- just "better." Now I do most of my frying in a vintage cast iron pan instead! I seem to remember a very large lasagna type "French Black" dish. My french black extra large casserole shattered when my husband dropped it on the ceramic tile floor. Since then it has been my mission to find it on ebay. Have not found it yet...they did make this in French White. Am I imagining things? I also agree not happy with the new material they are making corningware out of. Anonymous from April 3rd - Sorry for the delay in replying. Anonymous from April 8th - I am very sad to hear about your French Black casserole dish. :( If you are referring to the "Open Roaster" (A-21-B) that was 14 x 11 1/2 x 2 1/2 and held 4.5 liters then yes, I have seen them in French Black and the Bisque as well, though they seem to be fairly rare.... at least here they are. I think I have seen 2 in the last 7 years. I will keep an eye out for one. The 2.8 liter covered casserole seems to be the most popular, followed by the souffle and quiche dishes. I have pieces of corning ware from a set I received at my bridal shower 45 years ago. I still use them (I even have the 4-inch square "petite pan). Question: I have the 6 cup teapot from the the same 45 year-old set and wonder if I can use it on my ceramic stove top? I wondered if heating the teapot on the much newer ceramic surface material might cause the teapot to adhere to the stove's surface? (Obviously I would not let the teapot's water boil away.) Thanks! Anonymous from May 17th - Your teapot should work fine on a ceramic cook-top. I use mine on my Gallery series Frigidaire Radiant cook-top all the time. LOVE it! In fact, the only type of cook-tops not conducive to pyro-ceramic are the new induction cook-tops, since Corningware is nonmetallic. I'm so happy to have found your blog! I love my Corningware--still have pieces that were wedding gifts 35 years ago. Just recently gave a piece to my son's fiance. Now I scout out the thrift stores. I recently bought a piece that doesn't say OK for range. It's the Fruit Basket pattern. On the back of the handle it says A-2-B 2L and below that it has 08. I feel pretty sure that it's pyroceram, but how to know for sure? Hi Rhon, thank you so much for stopping by. I am glad you found Corningware411 too. :). As luck would have it, my next pattern post was going to be "Fruit Basket" because I think I have finally collected enough pictures. (Different sizes have different fruits on them). It should be safe for stove top, as long as the bottom is flat and does not have a rough "fireing" ring from where it sat in the kiln. That would mean it's the newer stoneware replacement produced by World Kitchen, LLC. It's usually safe to assume that if it is marked with an A-number, that it is the original pyroceramic formula we all know and love. Greetings From Costa Rica. Thank you to share your expertise in Corning Ware products. You helped me to elucidate some doubts. To your knowledge, are all "French Black" pieces Pyroceram? The pop up on eBay from time to time and aren't too pricey - can I bid with confidence that I will NOT be stuck with stoneware when the mailman cometh? Joseph - An excellent question. To my knowledge, all pieces of Classic Black (French Black) are made of pyroceram material. I do not believe the stoneware French white design has ever been made by World Kitchen in black. The best way to tell for sure is if the eBay seller idea the model number in the listing. They should start with an "F". World Kitchen does not use model numbers on their stoneware. If you purchase a piece... Hold it up to an intense light sorce. True pyroceram Classic Black is actually a VERY dark ruby red color. I just bought a 5 qt dutch oven corning ware in pastel bouquet pattern but the pattern is only on one side, instead of throughout the pan (front and back). I compared it with the other matching set but apparently the smaller ones have the pattern throughout the whole pan. I called World Kitchen customer care, they said they need more time before getting back to me. Have you come across any corning ware with pattern only on 1 side? As far as I know, on the A-5-B 5 quart Dutch oven in Pastel Bouquet, the design is suppose to be printed all the way around the piece. Granted, that pattern was discontinued in the United States before World Kitchen purchased Corning's Consumer Products Division in 1998. So if they have re-released it to other markets, it may only be on one side... The only pieces I have seen are from the original run between 1985-1988. It could be a factory misprint, or lack of print, as the case may be, that was missed by the QC department. Personally, I have not seen any "missing" printing on any other pieces before. The Gourmet skillet has only one cornflower, but it is opposite the handle, so it was purposefully printed that way. I hope they will offer to replace it with a properly printed one. Can country cornflower be used on gas stove top? I could not find any writing on the pan that says range safe. Xia - To my knowledge, Country Cornflower was never made in stoneware, it is an original Pyroceram design produced by Corning Consumer Products before World Kitchen bought them out. As long as the bottom is smooth and doesn't have a firing ring from a kiln, you can use it on Gas, Electric coil and Radiant Glass cook tops. In fact, the only range surface that is not conducive to Pyroceram Corningware is Induction, since Pyroceram is non-metallic, the electromagnetic field has no effect on it. I see visions in amber and a slightly darker color of brown sometimes. I only see reference to amber, is that darker brown a variation? I have some sauce pans that the pan is amber but the lids are darker, is that stock? Do you have a code number for the various colors such as amber, cranberry in the cook wear clear lines that would identify which which it is when trying to find a used one? Personally I love the original Pyrex pieces and use many from the teens as well as the twenties and thirties. larryh - there may be a two fold answer to your question regarding lid color. The first Visions cookware to hit the American Market was produced in France and shipped to North America. When Corning found out how well it was received, they refitted the West Virginia plant (closed by World Kitchen in 2002) to manufacture Visions in the U.S. It is possible that the formula produced in WV is slightly different from the original Avon, France formula. The Second potential reason is one that I cannot confirm for sure. I remember reading it somewhere, but for the life of me, I cannot remember where I read it. Originally, the Visions pots and lids were manufactured out to the same material. 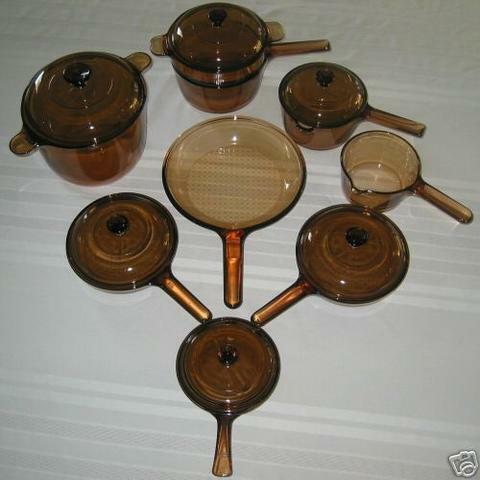 However, when the Amber Pyrex Bakeware line was released, to coordinate with Visions, the lids on Visions were switched the the same material as the Bakeware, which is a slightly different color. Thanks that may be what I am seeing then. I have seen people call some of the amber ones Smoke but I think that may be due to the color the alternative lids are.. Thank you for your blog. I have had an original corn flower set since I left home 40 years ago and have filled in missing pieces and lids @ goodwill etc. I was just getting ready to purchase a wedding gift for my niece and discovered the online shopworldkitchen.com and was getting ready to buy her a starter set when I discovered your site. Your info about the bottom firing ring got me thinking and I started checking my own collection and found my most used 2.5qt oval chicken roaster has the firing ring on it. Which I use in the oven all the time but sometimes make gravy on top of the stove. Now I am concerned because as an original user of corningware I never stopped to think that I couldnt use it on the stove....as the original was in fact safe on the stove. The new stuff actually states on the bottom that it is over safe and microwave safe but not stovetop. Thank you sooo much for bringing this to our attention. Here I was excited to see that corningware was still in business but as so many things today new companies take over and claim to be reproducing the same product when in fact they are not. They lie to us and make copy cats of beloved products of old. So is the "Pyrex" brand suffering from the same issues...are they in fact a separate brand or just an off shoot of corning ware. I realize I have Cranberry set that I bought at goodwill but thought it was "Pyrex"
I am very glad that your stoneware French White has not broken or cracked from stovetop use. Whew! As far as Pyrex is concerned... In 1999 Corning Consumer Products Division was sold to Borden. Their product line included Corningware, Corelle and Pyrex products. I believe it was Borden that filed for bankruptcy and did a reorganization into what is now World Kitchen. So all "Corning Ware", Corelle and Pyrex are now manufactured by World Kitchen. Though, as far as I know, they are actually contracting with other companies to manufacture their stuff. Most of which is in China, but I do believe that the "New" Corningware Stovetop line is being manufactured by ARC in France. Sadly, Pyrex is no longer Borosilicate glass, and hasn't been for awhile. The way I understand it, once Borden bought the Consumer Products division, Pyrex bakeware was switched over to Tempered Soda Lime glass to save money. Things like the mixing bowls, refrigerator dishes and casseroles that were made of "Opal" glass with painted designs, were always made of partially crystallized Soda Lime Glass. I fell in love with corning ware since I got a set from my mom . Now I've added a symphony set and silk and roses too . Can I use the symphony on the stove ? Yes, if it's Cornflower from the 70's, then you should be able to use it on the stove, just remember to never use higher than medium heat... Newer stoves are are capable of much higher heat than the older ones were. I wonder if that piece might be valuable, a collector's item? I had heard that glass is the only truly lead-free cookware material. I called them to ask if this is true. They said all designs on Corningware/Corelle have lead in the paint used. It is on the outside, so the risk of lead getting into your food is far less. Still, being uber cautious about lead, I now only go for the all white unpainted just in case it might get into the dishwater, onto the dish sponge, etc. Thank you for that bit of information, I had no idea that the exterior enamel designs had lead on them. That is good to know. Love your blog! Thank you for providing this information for us all. I was wondering how I can tell what glass lids are the borosilicate glass and which are the lime soda glass? oops. misspoke myself a bit...They said when I called that any color design...even the designs on the corelle plates have lead in the glaze. So it is not just the exterior designs on the bakeware/casseroles. Oh, it's in the glaze? Then they are probably talking about the stoneware stuff they are producing now, not the vintage pyroceram cookware. I think the "laminated glass" Corelle would be safe. The design is suppose to be under the top layer of glass. It's suppose to keep the design from wearing off the plates, but it may have the added benefit of keeping the lead in the painted design from coming into contact with your food. That being said, I know they make a lot of stoneware plates now too. They don't sound like their safe at all if there is lead int he glazing. Yikes! Love the blog. I only just realized that Corningware is no longer "Corningware". I have some much loved and much used French White pieces I bought back in 99 which are the smooth-bottomed, bright white pieces which i presume are the originals. I recently bought some more Corningware only to find it didn't look as white and had writing on the bottom. I did a quick Google search and found your blog. I'm so disappointed I can't add to my pieces. Guess I'll have to keep an eye out. Hi Shane, Happy New Year and thank you for your most informative site! I have a question about an old piece of Corning Ware that I just picked up. It's a 6-cup teapot, # P104, and is in unused condition. But here's where it gets strange: for starters, it is not flat on the bottom, and doesn't sit flat on our flat-top stove (it rocks, but not in the good sense, lol). It also creaks and moans when the water is heating. It has progressively gotten worse, and now it actually jumps with suprising force when the water is near boiling, and makes quite a racket on the flat-top stove. It actually splashes water out onto the stovetop when it does this. These "jumps" happen with increased frequency as the water nears boiling. It's quite unnerving, and we have stopped using it for fear that it will literally explode on us. Any clue what's going on with this? Is CorningWare not compatible with direct contact on flat-top stoves, or is this some other phenomenon that could indicate we have a highly defective piece? Hello Bill, thanks for stopping by. I use my Corningware Teapots on my Frigidaire Gallery II Radiant Glass Cooktop ALL the time, so my guess is that you have a deformed teapot that managed to make it through the QC department. It sometimes happens, The glass doesn't cool fast enough after forming and slumps a little. Or the bottom may be thinner than it's suppose to be. I had a 3 cup teapot with a slanted spout that was higher on one side than the other, which made pouring from it extremely interesting. As far as noise, they do kind of make a strange noise when they begin to boil... almost a crackling sound, but they should not be spurting water all over the stove. There may be rough spots on the inside that are allowing for excessive bubbling by providing too many nucleation points. Q1: Can I assume that it is safe to use my Spice of Life and the Cornflower dishes on electric stove-top, the oven, and the microwave? Some of them say "range, oven, microwave safe". But others in the same collection (and sometimes identical pieces) don't say anything or just say "range" or "microwave". Q2) Are there limitations on how much heat or oven temperature and cooking time they can withstand on the range, as well as the oven? What about the lids? Q3) When I visit my parents, they have a glass-top electric range. Can my Spice of Life and the Cornflower cookware be used on glass-top electric ranges as well? What are the restrictions, if any? Thank you for your patience, and I would really appreciate a detailed response if possible. Thank you for stopping by, and thank you for your questions. I would be more than happy to help.. In answer to your first question, Yes... Neither Cornflower nor Spice o' Life have been reproduced in stoneware so they are safe to use on the Stove (Range) in the Oven, under the Broiler and in the Microwave. If you have any that are Microwave browners, they cannot be used in the oven or on the stove... Microwave browners have a silvery gray patch on the underside that is Tin Oxide. This is the material that absorbs the energy in the Microwave and heats the pan up so you can brown food as it cooks in the Microwave... These are specialty pieces and have a single use. As far as heat tolerance is concerned.. I never like to cook on the Stove at anything higher than Medium/Medium high (unless I am boiling water)... Stoves now days are capable of higher temperatures than they were when Corningware was released. As far as the oven... I would not bake at anything above 475 Degrees. Corningware is capable of withstanding higher temperatures (or they would not have used it on missile nosecones) but your food will burn and stick at anything above 475 anyway. As far as the lids go... They can be used in the Oven but not under the Broiler, nor should they ever touch a burner on the stove directly. Sitting on top of a Corningware pot while it's simmering away on the stove is fine, but they cannot withstand direct contact with heating elements. Corning ware on a Radiant Glass Cooktop is fine. That is what I have, and I have never had any problems..... (As the recipes on this site will show) It helps a little, if you have the Cookmate models, because they are specially ground on the bottom to be perfectly flat. But in all honesty... Since Corningware doesn't warp when it is heated, like metal pans can do, even the pieces that are not "flat-ground" make excellent contact and heat transfer.. Temperaturewise, the same restriction holds true... Unless boiling water, I would not go higher than "just" above Medium heat. MitchOnTheMove..... I don't think it did. I didn't get an email notification for any comment but the one where you asked if your comment posted. Sorry. Sadly, true pyroceram Corning Ware is not longer in production. It was discontinued in 2000 when World Kitchen bought Corning Consumer Products Division. That particular pattern, though, had already been discontinued in 1994. The only way to find one is to purchase on of one of the major auction sites, such as eBay or Etsy. Loved learning the history of the brand! -- thank you for sharing this! I have a 2pc set of the cornflower square casseroles that I purchased around 28yrs ago, if memory serves. 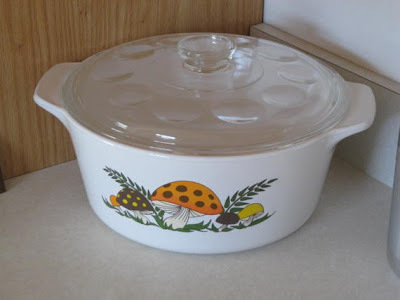 I also have a beige (with mushroom print) 4pc mixing bowl set with handle & spout, which is Pyrex, that I purchased at about the exact same time -- is/was corningware joint with them? -- (I somehow thought they were). Bren, Sorry for the delay in getting back to you, I have not been receiving emails when people leave comments. Your teapot should do fine in the dishwasher, however, the Bakelite handle should be removed. Bakelite does not do well in the dishwasher at all. But it is only attached with a screw, so it should not be too hard to remove the screw, handle and band and run it through the dishwasher. I usually simmer a little bit of bleach in mine for a few minutes when it needs cleaning. Sorry if this ends up being a duplicate post. I was wondering about using my little grab and go pan on a gas stove. I used it on a glass cooktop before and it was fine but I got nervous to use it on the gas stove. What do you think? Yes... Vintage Corning Ware is safe for Gas Ranges too. Just keep thr flame at medium or lower, just like an electric coil or radiant glass cook top. I can't think of any reason why you could not use the little grab and go pan on a gas stove. To my knowledge those were never made of anything but the "real" pyroceram. Can I cook meat at 450 degree on the old corning ware P19 meat platter safely? I have just one "complaint" re the vintage Corning Ware -- and that is that the handle I had for the petit pans falls off without warning. I nearly had a very bad accident due to this happening today and was very fortunate and blessed to have been holding the pan over the kitchen sink when the pan fell from the handle with no warning and splashed over half a stick of hot butter. I have thrown away that handle. It is the kind with the "lever" on TOP. I have another handle (that I use on my vintage Corning sauce pan with no lever on top and have had NO problems with that one, so that will be the smallest Corning stovetop pan I will use. Hi! Super fun read and thanks for sharing all of your knowledge! I recently bought what looks like Amber visions 4.5 L dutch oven but...the handles look different and aren't stamped with pyrex or visions, but the bottom is stamped with Corning. Any idea what these are?? More than likely, the piece you have is a Visions piece made after Borden, Inc. took over the Corning Consumer Products Division in 1998... I have a couple pieces of "newer" shaped Corning Ware that have the same "Corning" marking on the bottom, with no other information. I love to cook, especially to create new and healthier recipes. Since I work out of my home and nearly always near the kitchen, slow cooking at lower temperatures is a favorite of mine - and I can do this so much more enjoyably now with my vintage Corning Ware dishes! Turn oven to 225-250 degrees F. No need to preheat, and since I'm using the Pyrex lid I would rather the heat go up slowly anyhow. (Good to use oven thermometer as it is no uncommon for ovens to run 75-100 degrees higher than the temp listed on the dial!) Put petit pan with above mixture in oven with glass lid covering. After about 45 minutes remove from oven and stir and then put back in oven for another 45 minutes to hour and a half. It's done! Add butter and/or sweetener(s) and enjoy. Combine all in pan and give it a quick stir. Put in 225-250 degree oven. After about 45 min to 1 hour, take it out and give it another stir, then return to oven for another hour and a half. Take out of oven and lift lid. Viola. Moist and soft sweet potato sitting in some of its own sweet juice. I like to add a wee bit of honey or maple syrup and butter to my hot sweet potato. Delish and so easy! I hope you enjoy the recipes. I sure do! P.S. 2 hours works for me for a smallish sweet potato and I live in a low altitude. If you live in a high altitude like Denver, you will want to increase the temperature on all these recipes by about 25 degrees (and it may take a little less time to cook). I think running an oven is too much energy use for just a 2 cups of oatmeal. Putting on the range and simmering for 20 minutes or so would be more economical. Also, I peel sweet potatoes, slice and put like cookies on a cookie sheet bake at 400 til soft, maybe 20-30 minutes. Just as delicious as your recipe. I have been having a heck of a time finding a lid for my S-2.5-B Corning Ware (Peach Floral) saucepan. 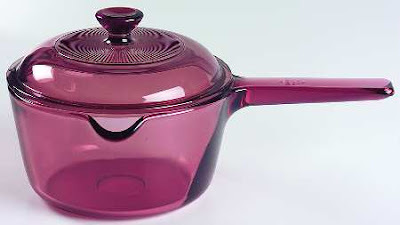 Taking a clue from World Kitchen's selling a "Pyrex V-2.5-C" lid specifically for the S-2.5-B saucepan, I purchased on eBay a Cranberry-colored V25C lid. It wasn't really the color I wanted, but I figured it would fit, and that was all I really cared about. It was about the right dimensions, but just slides across the top of the saucepan, finding no anchor at all. Totally non-workable. Do you have a handle on what lid I should be on the lookout for, for this S-2.5-B Corning Ware saucepan? Confusion abounds! Thanks. Sadly, the V-2.5-C lids do not fit on the F-1-B.... I tried many of the amber ones, when trying to find a lid for my French Bisque piece. It's a different size than the G-1-C that came with the F-1. You mean the V-25-C, without the "dot", right? That would actually be the V-33-B, I believe... (Because Corning liked to do things in a confusing way sometimes) I wish I could post pictures in the comments, but I cannot. They have rims that run all the way around the dish, and the lid fits down inside. I know there were at least 3 sizes of these... a 24oz (V-30), a 1 quart (V-31) and a 1.5 quart (V-32), and 2.5 quart (V-33). The lids match the quart size instead of the dish model number so they are V-1-C, V-1-C (both V-30 & V-31 take the same lid), V-15-C, V-25-C respectively. is how it is labeled. Wow, I must have a odd duck of a lid (but I think I already knew that much, lol). It is cranberry-colored. Oh, and thanks for the intel about the reason it was made without an inner rim, Shane. I couldn't figure that one out at all...! I am pretty new at collecting CorningWare and your posts are SO informative! I do have a question, though. I just purchased a Cornflower Blue casserole in used (and a bit gross) condition. I was able to clean it pretty well, but in doing so, noticed that there are ripples on the bottom. I was reading your blog and noticed you mentioned glass pour ripples and I'm wondering if that's what is on my piece. You can feel the ripples so my concern is that food will not cook evenly since the surface is uneven from ripples. Is that a correct assumption? Any information you can give me would be greatly appreciated! Glass pour ripples are fairly common in older pieces. They really do not effect the heat distribution as far as I can tell... The bottoms are thick enough that a little bit of irregularity is not a problem. But if they are particularly pronounced, they might make cleaning a little more difficult. Oh, there is one other thing I wanted to mention. When I got married in 1980, one of our wedding gifts was a large Visions skillet, which I loved. Why? Because it had a non-stick surface added to the glass. That's pretty much 10 years before you say they added it. I'm not saying you're wrong by any means, but I'm wondering if they had a trial version in Utah for some reason and I lucked out. Another friend of mine is now using it, 36 years later after I gave it to her because she'd lost many of her pans in a move. I would not be surprised if there was a test marketing study done in Utah. Visions was originally tested in the Texas area some 4 years before it's official release and marketing campaign began. But that is good to know, I only quoted that date because it was in one of the books, and several other things have been shown to be wrong in that particular book as well. Hi Shane. I have a casserole dish which says on the bottom "Pyrosil Provence Made in the Netherlands" and the code PV 3B/1,61. The design is of onions, peppers, mushrooms etc on muted rusts green and ochre called "L'Echalote La Marjolaine". The base is grey with very fine rings with a slight texture. I was given it in the 70s I think, here in the UK. I have barely used it and though I know it can go on a gas hob do you know if it can go on a ceramic hob? More importantly, will it be OK in a microwave? That's great! I've not seen any others anywhere....maybe they weren't popular in the uk. Must start to use it now I know how versatile it is! I had better start looking in car boot sales (uk equivalent of yard/garage sales) to try and get some more. Yes, they are safe for Glass Cooktops... In fact, they excel on such cooking surfaced. Corning themselves released the first Radiant Glass Cooktop back in 1967, dubbed "The Counter that Cooks". It came with a set of Corning Ware. You got a steal of a deal, Monica D.! The lid alone usually costs more than that much just in shipping! Least I have ever paid for that combo is closer to $20 plus shipping. 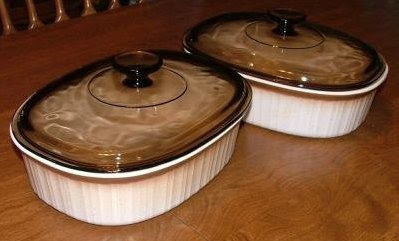 Yes, all vintage Corning Ware is Oven, Stove, Broiler & Microwave safe. In my opinion, just about any piece of Corning Ware under $5 is worth it. Can someone please tell me why I can not find any stamp at all on my Floral Bouquet 2nd edition? I have tons of CorningWare and everypiece has a stamp or embossment but this one! The holographic stamps are hard to see, of course, but this one doesn't even have that. An A12C lid fits, though I know it is not the original intended lid. Did Corning 'skip' the stamp on the 2nd edition Floral Bouquet by chance? My 2nd edition Floral Bouquet has no trace of a CorningWare stamp. Can someone please tell me if there is a chance they 'skipped' marking that pattern? Or maybe just the large one(s) as this one will take an A12C lid, and the dish without lid is about 2" tall. I have tons of CornigWare and can find at least a pale holographic stamp on all but this piece. Anyone else experienced this? Some of the marks on real Corningware is like a hologram you have to get it at just the right angle to the light to read it. It is a kind of shiny gray color and blends in when not looking for it. I think they wanted to try this as some people might have thought it would look better on the table without visible marks. Been using Corning Ware since the 70s. 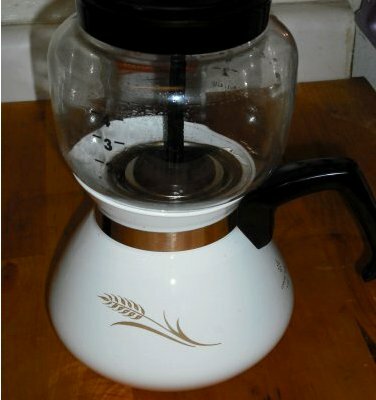 Do you know if the Corning ware stove top percolator contains lead in the inside? I gave in and I believe it is late 70s early 80s. Hi Shane, thank you for your great blog! I love my Pyroceram cookwaresss so much that I recently bought a Corningware 6 cup cornflower teapot from ebay (it's the first and only time I purchased a used item so far!). However, I'm not too sure about the material after I received it. Is the teapot made of Pyroceram too? Yes, the teapot is made of Pyroceram as well. It is just formed differently from the cookware, thus it is much thinner than a saucepan. I have an old Corning range topper skillet. Since it has the silver coating on the bottom, can I use it in the oven? It doesn't say oven use on the handle. Yes, you can use the range toppers in the oven. Where you CANNOT use them is in the microwave. Hunting for F-5-B lids, originally Pyrex G-5-C, I believe. World Kitchen insists their lid fits the 1.5 quart dish, but refuse to acknowledge or even say F-1-B. I believe they mean their current 1.5 quart dish, which isn't even available any more, except in sets. But what I find really disturbing are the pages of reviews by "Rach" in LA, almost one per week for months, citing the great fit on both really old (25-40 years old, I think) and new dishes, as well as 17 similar reviews about their plastic lids, however, the 4th plastic lid review actually states that the lid is too small, and they got one star. This is, of course, followed by 13 5-star reviews. Again, all by this "Rach" person. I'm calling them to the carpet on Twitter. I finally found dimensions for both old and new clear lids, and of course, the current lid is too small. I have not purchased one yet, even though they're less than $5, simply on principle. How many tens or hundreds of thousands have they sold that were never returned because they were too cheap to bother returning, or they were "functional, but not perfect." So, no wonder they've settled on "close enough" when they're really not. If they really cared about brand loyalty and good will, they'd support the pre 1998 stuff, too. It could even be boutique pricing. I found G-5-Cs on Amazon, and I hope they're legit. Any direction here would be nice. Also to legit F-5-PC lids. If the lid is embossed with a G-5-C on the rim,then it should fit properly. Your best bet for a proper fitting glass lid is to check in thrift stores. As far as the plastic lids go.... You are stuck ordering them from World Kitchen... I have been in their factory stores and they are still marked as F-5-PC. As to how well they seal, I do not know, because I have not purchased them. I have several of the plastic lids and really like them. They fit the corning very tightly and are handy in the fridge because you can stack items with the lids on. They say they are only top rack safe in the dishwasher but then I never use the heated drying cycle. So I figure I could use them in the lower one also. Just don't lose one or destroy one or you will kick yourself. I have been using the browning dish in my conventional oven for years. Works great. Now, I see that you are only supposed to use it in the microwave. Any thoughts? I just found the rangetop with lid five qt and a 2 1/2 court for range and microwave without lid in someone's trash today ! Can they both be used on the stove top and in the oven? I tried to enter my website along with my name and publish this but it wouldn't allow me. My name is Loren my website is muddypawsps.webs.net. I really don't like to post anything as anonymous but it's the only way it would take it. Thank you so much for all your hard work. Most of them are made of Suprema, which is a hybrid formula.. Sort of a cross between Centura and Corning Ware. Unlike both formulas, Suprema allows light to pass through. If you cant see light through the mug/cup, then it is a stoneware version. I have the 1969 corn flower percolator and I'm worried that the paint has lead in it? Can anyone tell me if this is true or not? I don't want to be heating my coffee every morning with this. I have been enjoying collecting Corning ware. I had a couple of pieces I used for many years. It made Thanksgiving and Christmas so much easier. I would just put a small turkey breast in the big casserole and stuffing in the smaller one and pop them in the oven. I also had a recipe for a Chicken casserole that I made for years. My problem now is what do I make in my corning ware pieces. I have used a 10 inch skillet for Tamale pie. I browned the ground beef in the skillet, added the other ingredients and then put the corn bread batter on top and pop it in the oven. I need more recipes like this. I also use the large casseroles to make homemade soups. But I am inspiration lacking these days. I have read cookbooks and such and am not coming across good recipes for corning ware. You don't need to look for specific recipes for your CorningWare... just try adapting your usual recipes to use your CorningWare, or using your CorningWare to make whatever newfound recipes appeal to you. Over the past 2 weeks, I've used various pieces from my Blue Cornflower collection to make eggplant parmesan, a quick tomato sauce (for the eggplant parm), General Tso's shrimp with broccoli, Chinese eggplant with garlic sauce, a mixed dal (masoor & moong dals), bhindi masala, aloo bhindi masala, zucchini in Thai green curry sauce, and rice pudding. I was wondering if you can help. It looks like someone took a metal fork and scratched my white rangefinder pot. It has gray marks inside it. Can this be cleaned or is the pot ruined? Thanks! Yes, it can be cleaned! I remember thirty years ago when I was first starting my own household, deciding to buy French White casserole dishes so they would always be easy to mix and match. I used the quiche dish often to transport and serve cookies and squares especially during the holidays. To my dismay, last Christmas I could not find my quiche dish. I asked all of my family members if I had left it at their houses to no avail. I figured, no problem, I would just pick up a new one at the Corningware store or Walmart. Well I soon realized I was sadly mistaken! That's when my obsession began and I have been scouring thrift stores for any original pieces of French White I can find. I will admit that tears sprang to my eyes when I found a quiche dish at Value Village! Today's find was an F14B roaster (no lid). It needed quite a bit of cleaning and I can't get the grey tinge off of the ridging so I guess the finish is worn. I also realized my Casual Elegance salad bowl is vintage, so I picked up a matching oblong bowl with lid at Value Village. I haven't been able to find any, but I would love to find some French Black. But my most exciting find so far has been a mint condition small white Buffet Server for 5 dollars! Now I'm really obsessed and want the other sizes! I have since had to buy a new shelving unit for my kitchen.